"Apteka" is polish for drug dispensary. I guess people must be running out of restaurant names, but the establishment itself does have a sort of pharmacy-esq je ne sais quoi. The white cement block walls are largely barren and the decor is simple. A true reminder of what it must have been like to live in Eastern Europe during the cold war. The food, however, is very exotic. 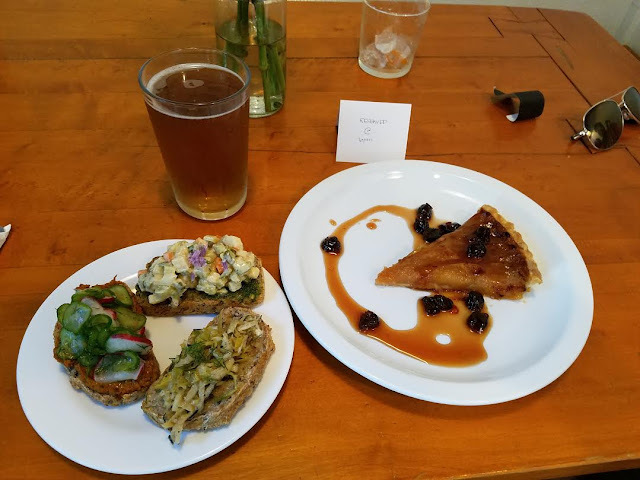 Pictured above are three separate vegetable tartines and an apple tart featuring some sour cherries. The tartines provided a great array of fresh and flavorful ingredients and they were easily the best dish I tried during my visit. They are somewhat difficult to describe as each had a different type of bean or pesto spread, a different vegetable topping and very unique flavors. The apple tart was also quite delightful. You really can't go wrong with sour cherries. Overall, I would say that the food at Apteka could be one of the best pure vegetarian options available in Pittsburgh. I generally find it very difficult to get excited by restaurants that don't serve meat as it always seems that many of the offerings attempt to mimic the flavor and texture of meat. (IE tofu scramble, seitan chicken wings or bean burgers.) Apteka on the other hand offers authentic old-world style dishes that really don't lack in any way from the exclusion of meat products. Do you spell it pirogi, perogie, pierogi, pyrogy or perogy? 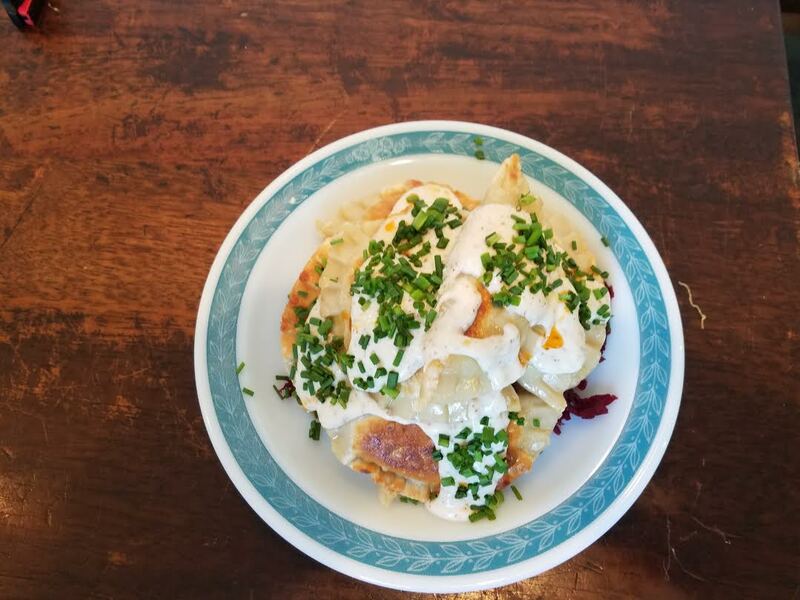 They offer two types of pierogi, a saurkraut and mushroom and a smoked potato with parsnip and turnip greens. I honestly thought I would prefer the saurkraut pierogi, but the smoked potato was so unique that it was absolutely may favorite. Homemade pierogis are always a treat and these are some of the best in the city. On a Thursday night the line for Apteka was out the door. Additionally, their staff is still working out the kinks and service was not great. Soon it looks like they will be opening an outdoor patio and I can only imagine that the quality of the service improves as the restaurant finds its bearings. Give it a month or so. Also, be sure to try the tequila drink with wildflower, lime and orange.